Customized private branch exchange (PBX) phone systems to support all your business needs at prices you can afford. SE Ltd makes doing business simple. If you are looking for a new company phone system that can provide the mobility and integration support you need, come explore our wide selection of PBX systems. We work with you to assess your business needs and to come up with a system that's perfect for your business-with all the features you need and none of the features you don't! Switchvox Notifier fully integrates with Outlook® Calendars, Emails, Tasks and Contacts as well as Word®, PowerPoint® and Excel®. Receive, transfer and record calls from any phone and any location through Switchvox. With the mobile apps for the iPhone and Blackberry, you can easily access your favorite features of Switchvox from your smart phone. With Switchvox, fax is integrated so you no longer need a separate fax server. All faxes are delivered directly to your inbox! Plus, you can use the same number for calls and faxes. Switchvox's XML-based Extend API makes it easy for a web application developer to integrate Switchvox with any web tool, without any Switchvox-specific training. Switchvox's Switchboard has click-to-call, and drag-and-drop transfers, and other features that make it easier than ever to communicate intuitively. Your employees can work smarter when they have access to all office communications within a single screen. See who is in the office, and know who is on a call or away from their desk. By mixing VoIP with traditional calls, your business can optimize communications and save money without sacrificing features. Great for training or auditing calls, Switchvox's recording and monitoring features are just one click away. Not just for the call center, Switchvox brings powerful call queuing functionality to even the smallest business that needs to efficiently handle inbound calls. Receive your calls no matter where you are - in your office or on the road. Seamlessly transfer calls between your mobile device and your deskphone without interrupting the conversation. 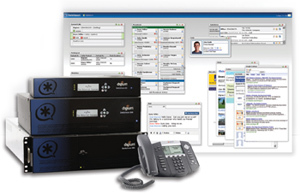 Switchvox provides you the flexibility to easily control how your calls are handled. Administrators have access to detailed reporting to know how to effectively staff queues. Generate real-time, scheduled or on-demand reports for many events in Switchvox. Efficiently handle all of your inbound calls with call queues. Every member of the queue can see real-time queue statistics and the caller's CRM record directly from the Switchboard. Not sure which system is right for you? That's OK! SE Ltd is here to learn about your business goals and help you identify the right product for your business. Call us today at (01572 338098 and speak with one of our phone system specialists, or click here to contact us through our website.